The setup for Freedom Wings does works fine, but was not designed for non-gamers and new gamers. The menu's interface is designed as a number of themed menus and sub-menus, requiring the user to enter "Airport" and then "Comm." and then "Download" before the demo can be sent. The forced opening sequence is long. Everything within the menus works as expected, with tapping registered correctly and more than enough buffer space. The interface would be flaweless if it weren't for the problem mentioned above. There are two different control schemes in Freedom Wings, and both of them are severly flawed. Using manual controls, one small tilt in one direction is enought to spin the plane. Manual also requires constant attention to the flying, which detracts from the ability to track (and deal with) enemies. Using automatic controls, the interface is not intuitive (the controls don't flow in a natural, expected way) and the plane's reaction times are far too slow. In both modes, the game gives virtually no on-screen indication of speed: you can speed up and slow down as much as you'd like, but you won't see any changes on-screen (beside the throttle). The problem is that in manual control, nothing is automatic and in automatic control, there is too little control and reactions are too slow. The game looks good, graphically, but many of the details are too small and there's too much going on on to really notice what works. What doesn't work (graphically) really stands out, though. For example, you can be looking ahead and see clear skies beyond the horizon, but then you'll suddenly be inside a thick cloud. The gun sound effects are more than a little ridiculous, sounding like a hand-cranked rail gun (which isn't indicated by the graphics) and with three or four "gunshot" sound effects per each bullet fired. There are no selectable options (like difficulty levels). Gee, where do I start? Freedom Wings - to me - is an honest attempt at a flight simulator program with a plot, but without any of that pesky realism getting in the way. There's a ton going on at once, so much so that it's extemely difficult to impossible to watch every control and deal with the enemies. On top of that, the physics are way off, the controls are untenable, and the the programming is flawed. For example, the plane (if you don't take off and roll along the ground) can roll through buildings like they weren't there and it can roll on water as if it was blue-painted land, but it can't roll up a hillside. Also, why is it that a crash landing after getting shot ends the game, but crashing because you aim your plane at the ground causes you to re-spawn and live again? There are some really good things about the game, but far more really big things that have to be worked through. The main problem is this: there are just too many things going on (and the controls are too poor) for players to simply enjoy the game. Replace the themed menu button system with an easy-to-use menu (which can be optionally replaced in the settings of a player's profile). Find a middle ground between automatic and manual control schemes, where some things are automatic and some are manually controlled. Offer dificulty levels with different levels of flight control needed for each. Provide an on-screen speed indicator to visually represent when the plane is flying faster or slower (besides the throttle). Reveal far-off clouds if they're there before they're flown into. Fix the gun firing sound effects (both the sound itself and the quantity of shots per bullet fired) (see above). Why can the plane roll through buildings? Why can the plane roll on top of water? Why can't the plane roll up a hillside? Why does the plane re-spawn after a crash, but not after being shot down? 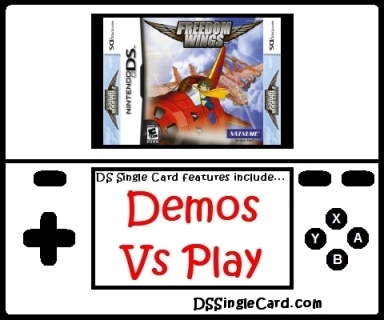 Click here to return to the DSSingleCard.com Freedom Wings profile.